The University Of Texas Pan American has announced that Cheech Marin and Erik Estrada will be celebrity speakers during the Hispanic Science, Technology and Engineering Week. The event takes place Sept 26-Oct 1. Last night, Cheech was in the 500 Festival Parade in Indianapolis and today he was at Indy signing autographs and watching the race (see photo). A new comedy club named the Majestic Theater & Cafe and Improv Comedy Club will be opening soon in Kansas City. 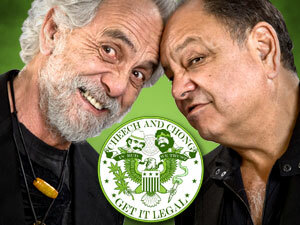 Tommy Chong is booked to perform there, but the date has yet to be announced. At last week's up fronts, CBS television announced that it will not be renewing Judging Amy. Cheech Marin had a recurring role as Tyne Daly's love interest on the show last season. The brilliant Tommy Chong turns 67 today. Tommy was born May 24th, 1938 in Edmonton, Alberta, Canada. As you may remember, Ashcroft made Tommy celebrate his last birthday behind bars (entrapment). Well, he's free at last. Brett Alexander is currently collaborating with legendary blues musician, Buddy Miles (both are good friends of Tommy), on sequels to his popular "Cheeb and Bong Puppet Theater" comedy album. Brett had Buddy give the Tommy Chong signature guitar he created a test drive before shipping it off to Tommy. The tentative titles for the new albums are Starweed: The Umperior Is Whack and Return Of The Red Eye. On the new albums, Buddy did some voices and played a Fender Roads piano, as well as the Tommy Chong guitar. Soon Brett will be appearing at Caroline Comedy Club in NYC. We will provide those dates as they become available. Ivan Reitman is releasing the DVD Stripes: Extended Cut on June 6th. This DVD contains 18 mins of previously unseen footage. Why are we writing about this? Cheech and Chong were originally cast for the roles played by Bill Murray and Harold Ramis. Cheech Marin, Luis Guzman and Efren Ramirez of Napoleon Dynamite fame will star in Something Blue, a Mexican horror film. It's currently in pre-production. On May 28th, Cheech Marin and a host of other celebrities will be participating in downtown Indianapolis' annual 500 parade. Over 300,000 spectators are expected. Tommy and his wife, Shelby will be performing at the Irvine Improv. Where: Irvine Improv, Irvine, CA. A documentary on Tommy Chong's wrongful imprisonment was one of the many highlights at today's marijuana rally in Washington DC.